In terms of length, I'd say Eroico is shorter than Kurovadis. However it has more CGs, 15 to Kurovadis's 9. There are a total of 3 levels, and 15 enemies with animations. Use that to consider if you feel like buying it or not, but also keep in mind that it will be funding the next game, as usual. Bug fixes: Fixed a major bug that caused an error message when clicking through menu's quickly (can't open file). A bunch of other stuff. I would want to buy it but it was hell to get through the first level, and I hear the second level is harder. It would be kind of nice to have a few more save points so I don't feel like I am playing 'i want to be the guy'. Good game, but platforming and lack of save points is painful. Game isn't that hard, and surely you can appreciate the effort and quality that went into this. $5 is nothin'. Buy the game, and test your skills. Get better and beat it. This isn't even NEAR "I want to be the guy" or Super Meat Boy in difficulty. Not even in the same ballpark. Besides, to my sadness he actually nerfed the hardest jumping section in the game. So, the horror stories you hear about act 2 are resolved. I'm confused, what has changed in this version? It would be nice if there was a changelog; but I think it is safe to assume that this version most important change has the monster gallery in it with is out the bugs he was having with the bug test version. I have to wait and see if Eroico goes through to DLsite, first. And then deal with any problems that may come of that. I guess I never did post the link to this bit of fanfiction on Eroico here. Includes m/f; monster girls on our hero. Howdy. Still taking bug reports? First, getting hit while a vampire is sucking your blood causes the vampire to disappear. Not a big deal. Second, delivering the final(?) blow to the second boss on the same frame that she reappears causes her to disappear without the battle ending. Slightly bigger deal. Maybe something about her "reappearance" animation cutting off her "boss explosion" animation, which prevents the game from realizing she's dead? Not sure how you programmed it, just a guess. Last, I noticed that level 2 has the same sword powerup platforms as level 1, but they don't seem to do anything. The sword starts out with its flame powerup when level 2 starts, and the platforms take the sparkly bits (souls? spirits? ), but neither of them give the sword beam. Are the platforms not working, or are they doing something more subtle, like raising defense? Anyway, excellent game, turned out very nicely, I think. The enemy gallery is a nice addition, even if it does seem to be causing people game-killing errors. It's unusual for me to play an H game several times in order to actually get better at the gameplay aspect. It really shows that you know your stuff from a design angle. 2. Upgrade the spell to one that hits everything on the screen. The wave is a power-up, not something you get from the platforms. There is actually only the one sword wave in the entire game. Kyrieru have you ever considered making any of your games on the vita, since sony just made the development kit free? Playing on Windows Vista, WINDOWED screen (instead of Fullscreen) ; when I die and press start to get to the GAME OVER (with CG) screen, the game window disappear somewhere in the top left of the laptop screen instead of showing the CG. The CONTINUE YES OR NO functions work normally. I'm not sure if I'm any clear. I don't really have anything else to add, since I barely managed to get past the first checkpoint, then couldn't go any farther. I had the same thing happen. Hit F4 to enable fullscreen and it should re-align the window. Just hit F4 again if you want to get out of fullscreen. hey just wondering what where u planning on doing with the vitality bar that appears when your in the h events were u planning on doing something more with that? Is there any kind of guide or walkthrough? I'm kinda just guessing what does what right now. I played through the demo on normal and hard and enjoyed it - bought the game and have no bugs to report. My biggest problem was figuring out the controls - I wasn't using a gamepad at the time and didn't realize down was block. My main input would be - rather than just changing how much damage the monsters do on normal and hard, why not also change their "attack speed" (or attack frequency). I didn't think hard was all that much more difficult than normal, since most of the difficulty in the game comes from finding enemy attack patterns and finding a way to deal with them without taking damage. If you had an interest in making easy easier, this would also be an option. All in all, thanks for making a great game! Hey kyrieru, if you're going to release it soon on DLSite I think a lot of players will wonder why the escape bar is divided in two groups. After all it doesn't have any effect in the gameplay. Have you planned using it for something or are you going to replace it with a generic escape bar like in Kurovadis? The game's pretty cool, I'm bad at it right now but if I ever clear (or once I do) the first level, I might buy the full game. However I can't deny that I'm slightly underwhelmed by the fact that the hero's a guy. I like playing a girl better, which is why I may have enjoyed Kurovadis more even at the first level. Anyhow, I'm eager to see what your next game will be now. i have a random q, i'm the guy that was asking about my controls getting messed (and i forgot my password so for now i'm anonymous lol) up and i wanted to know, if i couldn't fix it, should i be able to use my PS3 controller on my PC and it will work, it should right? Just bought and played it. I was a bit worried since the demo was difficult, thus, i thought the game would kill me. But in fact: It's really not that difficult once you get the hang of it. Most of it is memorizing and quick reacting. Thanks for the game. I'll look forward to the next one. One question though: I can't hit the last boss (which i will not spoiler of course. It is a nice surprise). Did i miss a powerup or do i have to do anything before i can hit her? I got the 3 complete hearts and the 2 Sword powerups. You know what? Scratch that. I figured it out. Turns out you can exploit the last boss as well. If you force the character to fall over she can't do any damage to you. Then you just wake up when it's time to attack her. Awesome game, btw. Best 5 bucks I've spent since Kurovadis. Looking forward to your next project. Kyrieru awesome game! I played through the demo and bought it for your extremely wonderful price of $5. If you make Eroico 2 I will buy that one too. It is hard to find GOOD monster girl games in which you play a male. 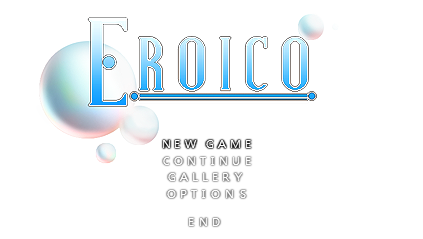 I have a few ideas for you for Eroico 2. Do you like ideas posted here or would you like them sent/posted somewhere else? Have to agree. I really love the music as well. It'd be awesome to see them released as an MP3 or something. I didn't know how to download so I sent my recipt to overtureinteractive@hotmail.com Could you send me a download link? I've bought the game as well, even though I sucked playing the demo. The only thing I wish was that there was at least a new save at the beginning of each new screen so I didn't have to keep going back to the very beginning of Level One every time I die on screen five and/or six. Any chance for there to be a corrections for that? Love your stuff. Bought it last week. The stretches between save points does seem long. Also loved Kurovadis. Would love to see a sequel to that. I do like the character size and resolution better in this game, however. Kurovadis characters seemed on the slightly small side. Of course, that is easier to draw/animate as well, I get that. Food for thought. At your quality and price, I'll always buy. Status update, concept for next game.